arctic chill | Badudets Everything Nice! For someone who loves dining out and traveling, I always carry something that will freshen up my breath. Though my kikay kit also contains my toothbrush and toothpaste, sometimes the situation doesn’t permit me to brush my teeth like if I’m in an event or during a lunch/dinner meeting or when I’m in a long drive. So mints, gums, and mouthwash are what I use for that instant fresh breath. Recently, I discovered that aside from food like onions and garlic, alcohol-based mouthwash can also cause bad breath. Seems logical to me because alcoholic drinks can cause bad breath too. 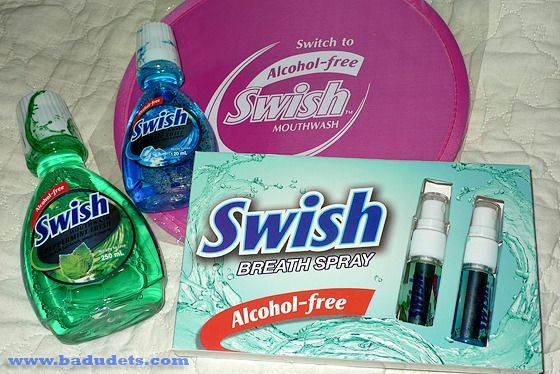 The solution, switch to alcohol-free mouthwash like Swish.